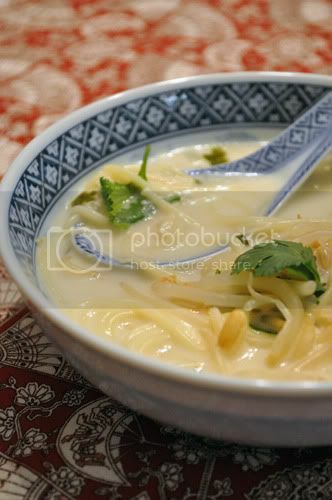 Week Three of ‘French Fridays with Dorie’ and Ms. Greenspan chooses her Spicy Vietnamese Chicken Noodle Soup. What looks like a very involved recipe, isn’t. It’s just a long list of super-intense flavors and ingredients. I didn’t think I’d have the time this week, but I really read over it (instead of quickly skimming) and rearranged my schedule to take the 30-45 minutes to whip this up. A few quick chops of this, a dash of that, pour the broth & milk in, add the chicken & noodles and cook! Still don’t have a copy of Around My French Table?? Get it now… 34% off at Amazon! A soup to really warm you up, right down to your toes. Your photo made me wish I had some now at tea time ! Totally agree..worth the time and effort. Love your photos too! It certainly was a lot less timeconsuming than it looked wasn’t it! The most surprising part of this recipe is definitely how easily it came together. Yours looks delicious! Your soup looks like a big bowl of comfort food! The most time consuming part was just finding the ingredients in the market. Your soup is spectacular! Beautiful soup! I also was surprised that it was an easy soup to put together. I had a hard time finding the coriander. Delicious soup u have and i loved it even w/o the spicy additions …love ur bowl!! Lovely soup. 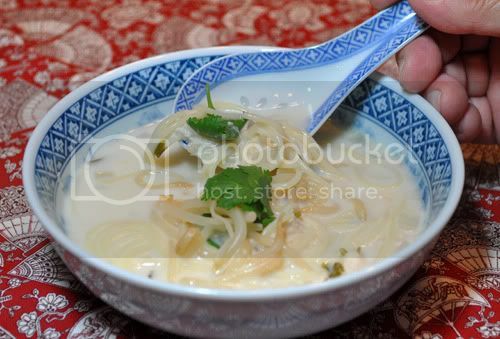 LOVE the asian bowl and spoon. Just enhances the whole presentation. Hmmm – looks oh so delicious and comforting.